Loosely adapted from a couple of recipes in the Joy of Cooking, this recipe is a great way to use up the leftovers from a roast chicken or Thanksgiving turkey. It's not exactly a time-saver; you'll need to make the pie crust, the cream sauce, and the sautéed vegetables to go along with the leftover meat. But you can prep everything ahead of time and stash it in the fridge. About an hour before you plan to dine, simply preheat the oven, roll out the crust, assemble the pie, and pop it in to bake. Dried or fresh herbs, such as parsley, sage, thyme, tarragon, etc. In a large saucepan or Dutch oven, melt the butter over medium-low heat. When melted, whisk in the flour and cook for a few minutes, until golden-brown and thick. Stir in the stock and then the milk, whisking lightly. Increase the heat to medium and, still whisking lightly, bring the mixture to a simmer; cook until the sauce has thickened a bit. Turn off the heat and stir in the wine, lemon juice, salt, pepper, and nutmeg. Fold in the shredded chicken. In a large skillet over medium-low heat, heat the oil and/or butter. Add the onion, carrot, and celery, and sauté for a few minutes, until the vegetables start to turn translucent. Add the mushrooms and garlic and continue to sauté for several more minutes, until the mushrooms turn glossy. Add the peas, if using, and whatever herbs you're using, and keep everything warm while you roll out the pie crust. When ready to assemble the pie, mix the vegetables in with the creamed chicken. 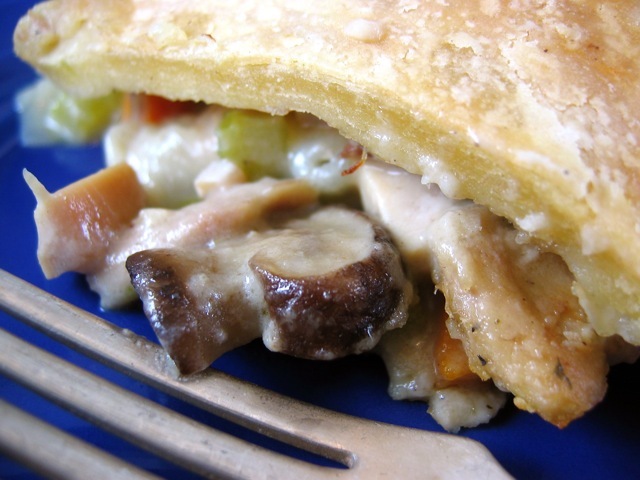 Ladle the chicken-vegetable-cream filling into a pie dish (on top of a bottom crust if you're making a two-crust pie) and top with pie crust; poke holes in the top crust. Place the pie on a baking sheet (to catch oozing juices) and bake for at least 30 minutes (for a single-crust pie) or 45 minutes (for a two-crust pie). Let cool for a few minutes, then slice to serve. If you have any filling left over, serve it another day over pasta, rice, or leftover mashed potatoes. If you have leftover gravy from your Thanksgiving dinner, use it as part of, or in addition to, the milk component of the sauce. Similarly, if you have leftover roasted vegetables, use them instead of sautéing fresh vegetables.